You know I’m a sucker for a dog, plus have a special affinity for Marines. Should it be any surprise that the latest Marine mascot, Chesty XIV gets another post here? I hope not. Chesty XIV comes from Stephens City, Virginia. Josette Keeler of the Northern Virginia Daily wrote a marvelous article about him that has details about him, including that his ‘brindle mark’ on his right shoulder looks, as I thought, like he’s wearing camouflage already. There’s a great gallery of photos of Chesty at PawNation. It turns out that his predecessor, SGT Chesty XIII, got his promotion to Sergeant after a confrontation with the SecDef’s golden retriever, Bravo. I will have to make sure to get down to the Marine barracks this summer to see if I can get a photo of Chesty. 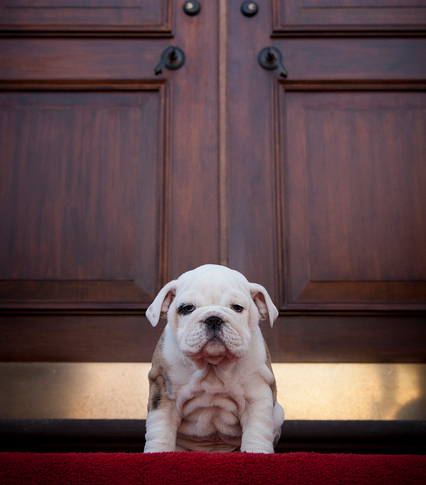 The new Marine Corps mascot, Chesty, has arrived at the Barracks at 8th and I to begin his obedience and recruit training.